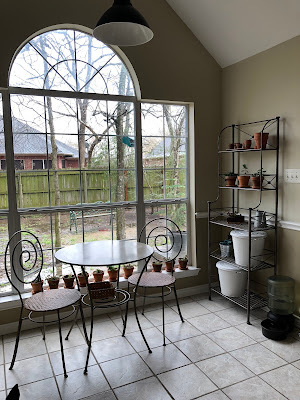 My Journey to Fit: FMM - Purging, Plants, and Paco! FMM - Purging, Plants, and Paco! We lived in our first house for six years, our second house for eight years, and have been in our current home for nearly 18 years. Moving often forces you to clean and purge as you pack; having lived here for so long means that there has been a lot to purge! 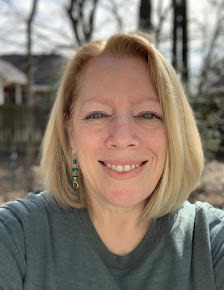 That said, I have now cleaned, purged, and organized the laundry room, our master bathroom, my closet, the nightstands and dresser drawers in our bedroom, my office, the kitchen, and the living room. I still need to work on the two closets in the guest rooms - I suspect a lot of that will be headed to our garage sale pile, which is getting quite large. I'm getting tired of doing this, but at the same time, it's necessary and it does feel good to know that when it's time to put everything back after our updates are finished, I'll only be putting back what I really want to keep. Another bonus of doing this is finding things that I knew were somewhere...turns out they were in one of my dresser drawers. My kitchen is too small to spare a drawer for a junk drawer, but the dresser? Perfect. combination lock - I was about ready to go buy a new one so I could lock up my purse at Planet Fitness but I found it just in time! good plastic bags from race expos - seriously, how many of these did I need to save?? Plus many more items that were sorted into either trash, Goodwill, or garage sale piles. I'll say one thing for forcing myself to do this - I've learned that I need to work harder at not letting so much stuff come into the house in the first place. 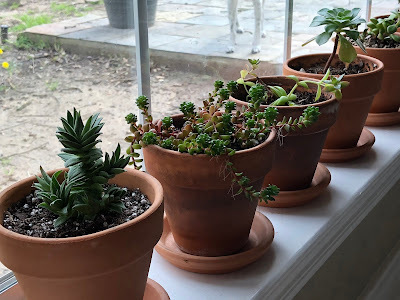 The white trash cans hold my succulent dirt and Perlite (which you can add to soil to make it drain even better). 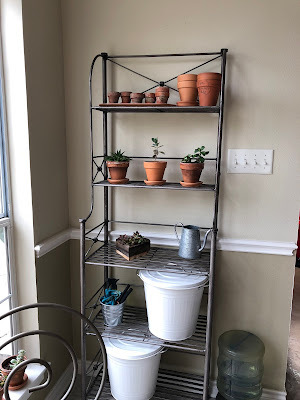 I think this is going to work - I have an old rectangular melamine tray that will fit on the widest shelf (the one currently holding the watering can and the wooden planter), so I can repot succulents there while containing dirt spill to the tray. This feels both functional and decorative! 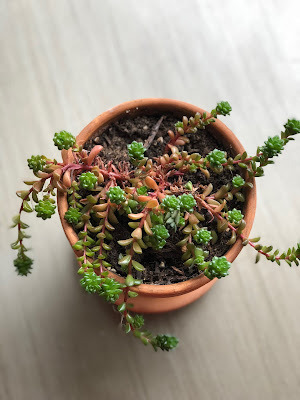 This one has been growing like crazy - I think it all came from one little stub of a plant that I bought in June. I love the different colors, too. These were tiny scraps that had fallen off a plant at a nursery Barbara and I visited when she was here in November. They were swept in a trash pile on a table; we picked them out and brought them home. 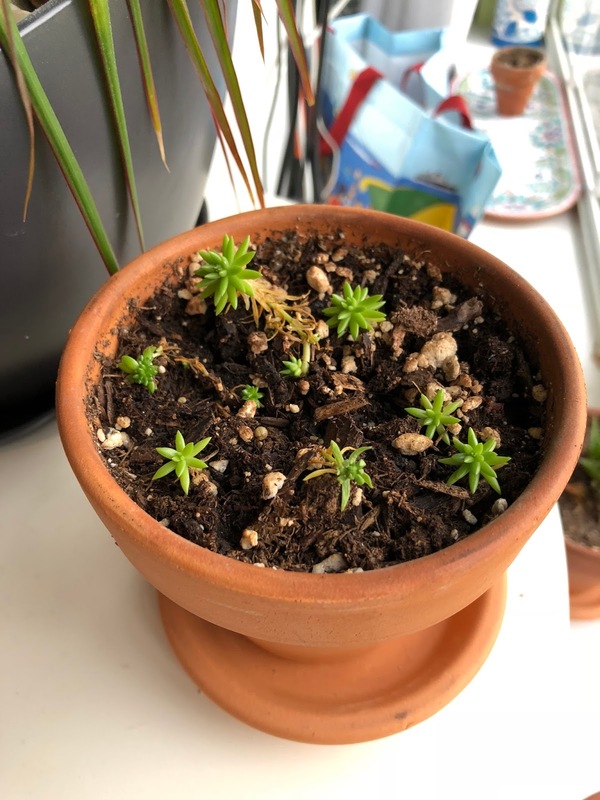 They've grown enough that I was able to plant them a couple of months ago - I love this about succulents, that they will grow from practically nothing! 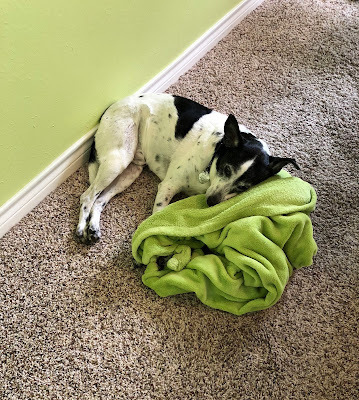 He drags his blanket all over my office, usually making a nest to sleep on. But this time he nosed it into a pillow, and then promptly laid down and took a nap! We have a 5K fun run to do tomorrow, and miracle of miracles, the weather should be not only cool, but dry! It's about time we have decent weather for a race. We have a few combination locks laying around the house but no combinations, so they are useless. And to get the combo, you have to jump through all kinds of hoops. Good luck on the 5k tomorrow! It's amazing how much stuff we accumulate over the years. We made a pact to not accept anymore stuff from family members out of obligation if we really don't want it /cant use it. My Nana would give us things all the time and I would feel obligated to keep them cus se gave it to me. Not no more! Your bakers rake looks great and I love your big window. I know I spotted Pacos little legs in the one pic and believe I spot the end of his tail in another, no? It was his ear in the corner - which could look like his tail, now that I see it. You guys are strong with not accepting things out of obligation - I know a lot of people have a hard time with that. I see his ear in the bottom corner of a pic + legs through the window. I love seeing pics of him! Have a great weekend! WINDY here!! Oh FINALLY, the silver lining to my having moved a gazillion times - lots of purging! Actually we filled another box with donations while unpacking last week, so apparently the urge to purge is never gone :) That's awesome that you've been able to go through so much - it's a pain but feels so good when you're done! There you go with the silver lining - but I hope you don't have to move again for a while now! Thanks - I really like it! 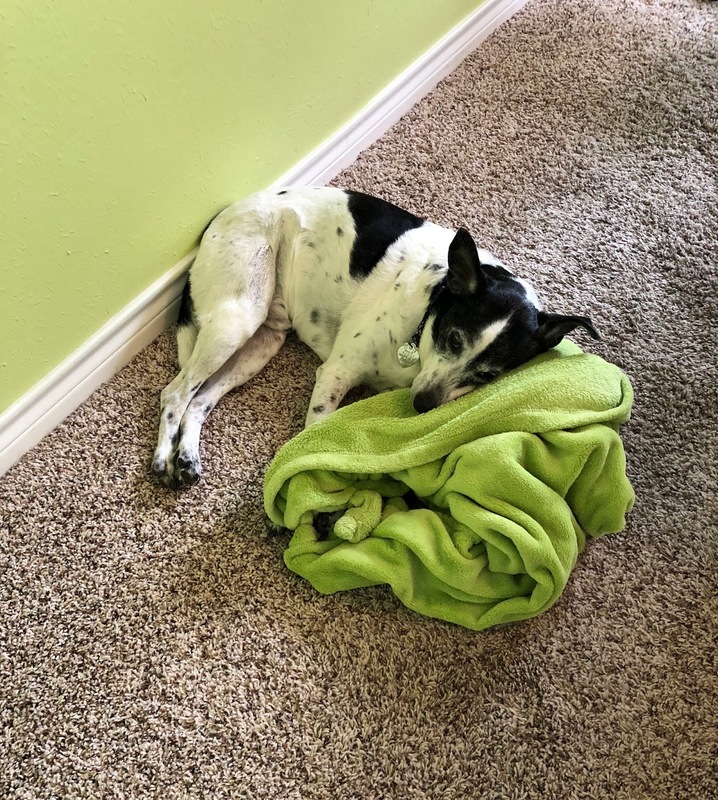 My three dogs all have their special blankets. It's funny how they aren't settled unless they have them to curl up with, on, and under. Thanks - I am really happy with how most of mine are doing. I love playing Where's Paco! Had to really work on the tinier piece of him hiding in the corner. Princess left one of her succulents behind accidentally at Christmas break (yes, my daughter brought her PLANTS home for the holiday LOL) and I am SO nervous it won't make it until she comes home for Spring Break at the end of the month. It's so funny because I have such a laissez faire attitude with my own plants - they know I'm a negligent waterer and they must learn to fend for themselves - but I am hyper-attentive to this little grandplant. Can't wait for her to come and rescue it! Grandplant made me LOL. 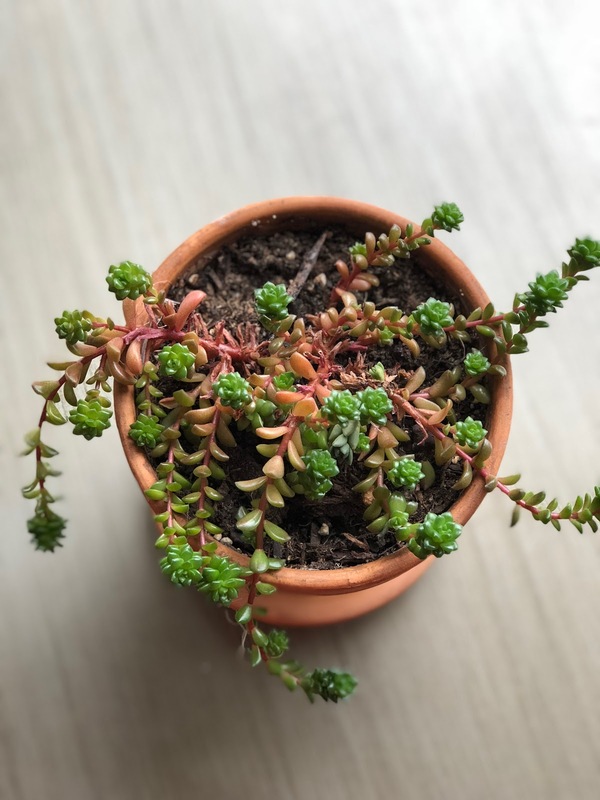 Usually succulents do well with a nice amount of neglect, but I totally understand your stress. Paco is too adorable with his blanket! 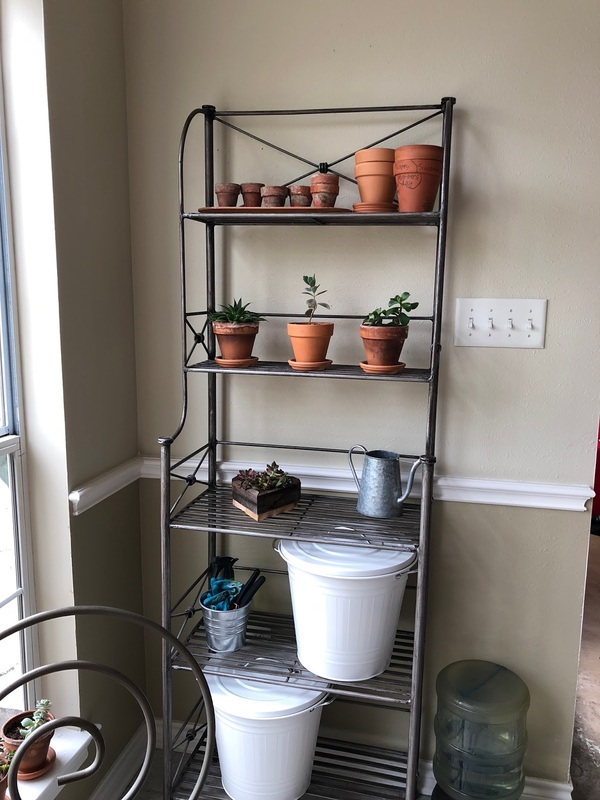 I like your baker's rack for your plants! Brilliant idea. Not bringing too much in to our home is something I work hard at. We bought a house not much bigger than our last one, so we purposefully don't have room for much more (sigh, but do need to build a garage for lawn equipment/etc.). Anyway, I was gonna say, I try the best but it's hard when you have thoughtful people in your life constantly giving you things... I come from a family of shoppers, and sometimes people just don't want to hear that you don't need that random thing. And I try to keep that in mind when I think of getting someone something random, too!!! I hope the purging is making you feel great, even though you are getting tired of it!